Business cases for smart collaboration abound, yet genuine creative collaboration in business is remarkably rare. As Distinguished Fellow at Harvard Law School Heidi Gardner PhD points out in her forthcoming book Smart Collaboration, people need to collaborate across a variety of specialisations as well as personal and cultural differences for them and their businesses to really garner the dividends of smart collaboration. What’s needed is both the logical business case and the interpersonal skills to work effectively with people who are different from yourself - as well as organisational structures that support collaboration and reward collective work products. When an individual departs, collaborative teams have triple the client retention rates of lone rangers. So what stops most organisations from actually reaping these collaboration benefits? Many would-be collaborators set out with great intentions, and then crash on the rocks of negative group dynamics before they or their organisation really get the multiplier effects of breaking down the silos. In the webinar, Gardner identified some of these barriers - for example blame or the assumption of blame - that arise when the people you are collaborating with look, feel, behave and think differently to yourself. It shows up as irritation with the very difference that is needed for collaboration to be creative. People start talking about how "they" (the different others on the would-be team) have their priorities/facts/ideas/culture/values wrong, or how "they" don't really listen properly to "us." Actually working in a monoculture can be attractive for the very reason that it is soothing to be amongst people who think and act in the same way. In my experience, both as an entrepreneurial CEO and as a systems coach, would-be collaborators across silos need more than just a business case to get past these barriers to collaboration. Many need to vent about the above frustrations first. Once they get that off their chest, they need support to open up to the value of those different perspectives, priorities and ways of being from the other silos. And for sure, they need to be convinced that those "others" are also listening to them in an equally balanced way. The good news is that the relationship systems skills needed to collaborate in diverse teams can be learned. Leaders need these skills to grow their businesses and reap the diversity and collaboration dividends Gardner articulates so clearly. I'm part of a global organisation dedicated to building greater Relationship Systems Intelligence among leaders and their teams, and it works. Last week it was brought home to me just how important constellations are as the language of relationship systems (relationship system = an interdependent group with common purpose or identity). A group of relatively new ORSC practitioners was meeting on Skype, coming from a variety of dimensions of our world – working in the cities and the townships, in companies and the public sector. It was the night before our local government elections. As each person checked in, it emerged that every single one had been using constellations in their work around the country. So much of our work is about seeing, feeling and hearing the system and revealing it to itself. And so much of what our country needs is for all voices to be heard. Yet we often lack a common language. Sometimes the power dynamics leave people feeling unsafe to say what they really want to say. 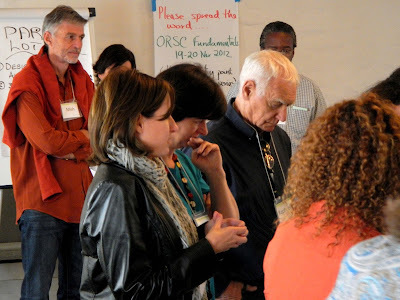 What touched us all on the call last week was how the relatively light, open style of ORSC informal constellations creates space for the delicate and vulnerable process of all people expressing themselves and being heard. And how it enriches our democracy to have more ways to be heard than only the (albeit precious) ballot box.